Downtown Los Angeles has recently been undergoing an effort to revitalize parts of the downtown area. Through more free events throughout the city as well as newly reconstructed areas, many parts of downtown LA are once again thriving. I bet you're wondering when Angel's Flight re-opening is? Well, we have exciting news! Angel’s Flight is set to re-open this Labor Day! Angel’s Flight is a funicular that connects the offices and apartments at Bunker Hill to the lower side of downtown where the Grand Central Market is. A funicular is a cable railroad located on mountainsides. Small trains are pulled up and down the railway through a system of cables and pulleys, similar to an elevator. While Angel’s Flight has been closed down for the last few years, the only thing connecting these two areas was the adjacent stairway that boasts 153 steps. The funicular has been a long-standing part of the downtown area. Angel’s Flight opened up in 1901 on New Year’s Eve. At that time, the funicular was used to shuttle residents living in elegant Victorian homes on Bunker Hill down to downtown L.A. where the jobs were located. For nearly five decades, Angel’s Flight made many trips up and down and carried over 100 million passengers. However, as residents began to move to suburbs around the 1950s, the city fell on hard times, and Angel’s flight was closed in 1969. After being closed for some years, the funicular finally reopened in 1996. However this time, it opened south of its original location at a 33-degree incline between Olive and Hill streets. Since then Angel’s Flight has opened and closed a few times, but it has been closed for the last several years. 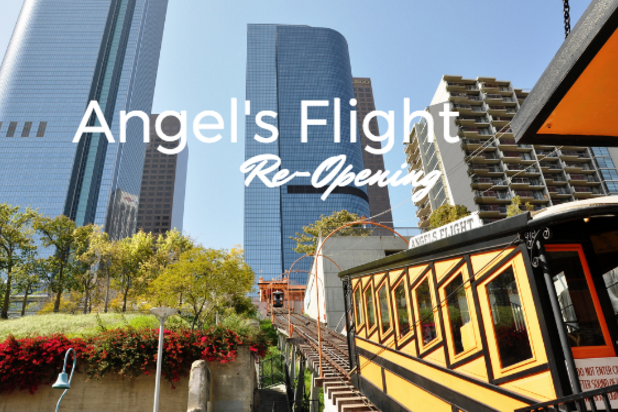 This Labor Day, stop by downtown LA and see the reopening of Angel’s Flight!